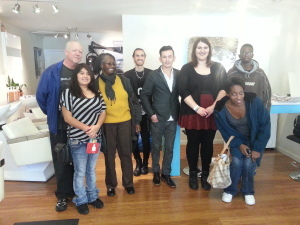 Anton Salon in Berkeley was a busy place on Dec. 22, during the rush before Christmas. Salon owner Joe Escobedo opened his doors and heart again this year to give back to the community, hel ping Bay Area homeless residents look good for the holiday season and upcoming job interviews. 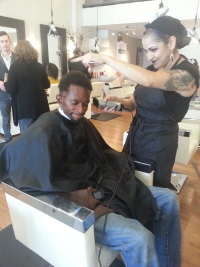 Homeless members of Richmond-based non-profit Saffron Strand, Inc. received a free holiday makeover to help them look better and feel better as they work to re-enter the local workforce. Saffron Strand specializes in helping the homeless and those at risk of homelessness get off the streets and back to work in jobs that lead to long-term careers. Joe is a founding board member of Saffron Strand. Anton Salon was full y staffed to take care of Saffron Strand members who began to arrive for their appointments early in the morning. 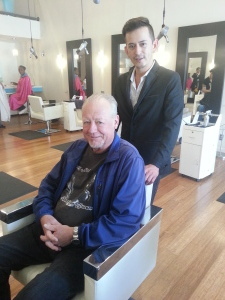 For most it was a new experience to feel relaxed and treated with respect – even pampered — in a professional salon. By afternoon, the salon’s mirrors reflected each member’s new haircut or hair style and job-ready appearance. Saffron Strand members were better prepared to go into the new year with renewed energy for the hard work ahead and hope for long-term employment. Members also received holiday presents containing hair care products to keep their new look fresh. Through a joint collaboration of Anton Salon and Saffron Strand, the members receive a free makeover multiple times throughout the year. Looking good at job interviews goes with marketable job skills, overall work readiness, and the support of an “intentional community” dedicated to getting all members back to work for the long term. Over the past six years, more than 150 homeless and formerly homeless Saffron Strand members have re-entered the workforce and more than 50 have sustained their employment two years or more. Founded in 2008, Saffron Strand, Inc. is a 501(c)(3) non-profit membership organization with the unique mission of getting the homeless and those at risk of homelessness off the streets and back to work for the long term. Our diverse Board of Directors is committed to alleviating poverty and improving the quality of life in the Bay Area by helping the most vulnerable residents find lifelong careers. Our homeless members overcome their individual barriers to employment, learn marketable job skills, and help run the organization, including our national annual Homeless Workforce Conference, which provides specialized employment services training for professionals and others who help vulnerable populations.